Murano hand blown blue, white and gold flecks Italian art glass corseted flower vase. Attributed to the Salviati Company, circa 1950s. It can be turned up-side-down giving it a different design all together. Very unique piece. Measures: 9 5/8" tall. Venetian early 20th century, age Art Nouveau, large amphora vase attributed Salviati Murano glass, amber color, etched with floral motifs. A Murano glass vase produced by Salviati in 1991. Signed. 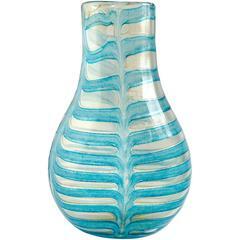 Mid-20th century, Murano art glass clear vase with blue twisted ribbon and solid white stripes.